Movie Review: “Labyrinth of Lies” is a German historical drama, set in 1958, that addresses the dignified endeavors of the young state prosecutor, Johan Radmann, who sets mind on taking to the justice the unpunished SS officials and doctors who still live freely after torturing and killing thousands of innocent people in the terrifying Auschwitz concentration camp during the world war. The shame of a complicated past of a powerful country seduced by Hitler’s Nazi regime, falls on Radmann, stiffly played by Alexander Fehling, who sees former Nazis everywhere. During the relentless investigation, a labyrinth that nobody wants to deal with, he unveils a few painful truths that devastate him inside, to the point of wanting to abandon the task. His best friend, the zealous journalist Thomas Gnielka (André Szymanski), was a member of the party when he was very young, as well as the father of his seductive girlfriend, Marlene (Friederike Becht), and his own father who's still missing since the end of the war. Radmann starts interviewing former victims of Auschwitz, while trying to capture the abominable, unrepentant culprits such as Schultz, who was teaching children at a school, and Dr. Josef Mengele, who is now living in Buenos Aires and was responsible for inhumane lab experiences that took the life of the twin little daughters of the artist Simon Kirsch (Johannes Krisch), a tormented soul who survived the camp and hardly agrees to collaborate. Radmann’s honorable cause, here depicted with no less estimable intentions by the Italian actor-turned-director, Giulio Ricciarelli (directorial debut), isn’t a synonym of an accomplished movie. Actually, an obstructive formalism in the approach and the rusty performances aggravate the issues of a post-holocaust account that struggles in a few instances to find cohesion and tightness. 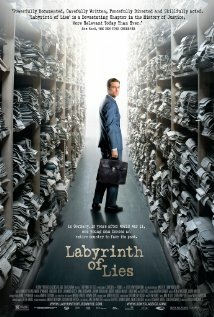 Adopting tidy visuals and swinging between Hollywood’s standard twitches and TV series’ monotone routines, “Labyrinth of Lies” lacks intrigue and never manages to really speak to the heart. Its artificial undertones were the main reason why Mr. Ricciarelli couldn’t extract more and better from a strong real story. And thus, the film instantly vanishes from our minds when the theater lights are turned on.